What Format Should My Brochure Be In? What Are Bleeds And Do I Need Them? We've tried to give you helpful and complete information here. That means there is quite a bit to read as we have to cover all of the options you DON'T want as well as all of the options you DO want. Don't panic! Much of it boils down to common sense and a few key things to remember. Once you have read this guide, you can call the Helpdesk to discuss anything you need more help with. But, please read the guide first. Why should you bother with all this? Getting a job commercially printed requires you to prepare your artwork in a specific way. Once you understand this, it's easy to do and you'll get the results that you want. If you don't follow these simple steps, then you may end up with a job that you're not happy with. Send us 1 PDF file with all the pages of your booklet, including the covers. Read on for more information. Do you need some help understanding the order process? Although we do pre-crease covers above 150gsm please be aware that some cracking (visible white paper fibres) can occur along the spine. This is generally not an issue, but be aware that this can happen and plan accordingly. Light colours on the spine will almost never exhibit cracking. Very dark colours may depending on the type of paper and grain direction. We recommend lamination for covers where you absolutely have to have a solid black (for example) right over the spine. The thicker your booklet / brochure / magazine is, the more difficult it will be to close. This, of course, is common sense. Nobody would expect a small 72 page booklet printed on heavy paper with a laminated card cover to lie perfectly flat would they? Well in ten years and many, many millions of booklets printed and finished, we have had two complaints from customers about exactly this. Even though they were warned verbally by the helpdesk that this was an issue. So this warning is to make sure that we don't have complaint number three! Does this mean that you can't have higher pagination booklets? Absolutely not, they are usually perfectly usable and people are very happy with them. If you are unsure and intend on printing a larger quantity, then it makes sense to order a very small trial run initially. You can then make certain that the booklets are fit for YOUR purposes. We're back to common sense again, aren't we? The prices you see on the web site are for printing from your print ready PDF. We don't include for any design work in the price. Your quotation shows exactly what is included, for example delivery. Physically, booklets must have multiples of 4 pages! Even though we only allow you to order in multiples of 4 pages, it's still worth repeating this in the artwork preparation guide as the proofing team get a steady trickle of artwork supplied with the wrong number of pages. 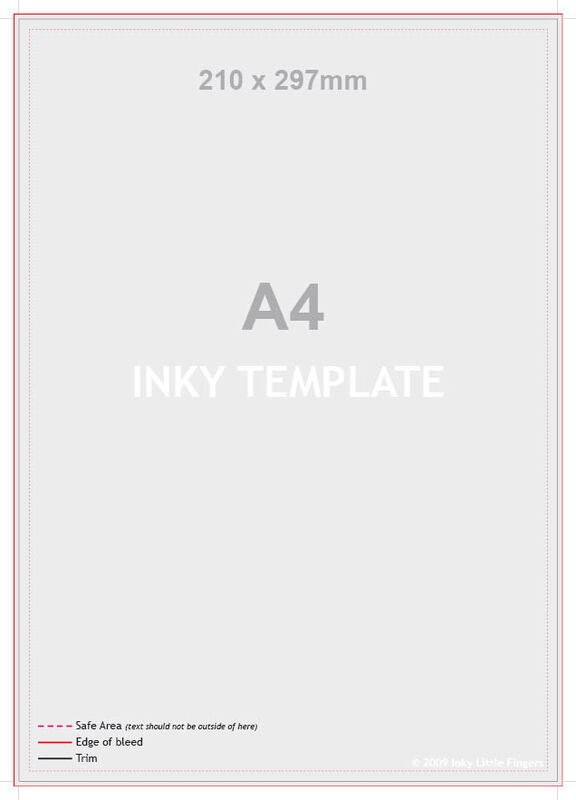 If you only have 7 pages, then you must insert a blank page at the point where you want it to be before sending us your PDF. Why are we so mean that we don't automatically insert blank pages for you? The reason is simply that we don't know where you want your blank page or pages inserted! If you have any problems inserting blank pages yourself, don't worry! Let the helpdesk know where you want a blank page or pages inserted at the time you place your order and we'll do that for you while preparing your artwork. Understanding some of the lingo is useful as we'll use it when an exact meaning is required. Plus it may come up in Trivial Pursuit one day. This is the electronic file (usually a PDF) that you send us to print. Are booklets and brochures different? No, a booklet is just another name for a brochure, they are exactly the same thing. PDFs are the closest thing we have to a "stable " format. This means that what you see on your screen is the same as we see on our screens and is the same as we print for you. That's not the case if you send anything else. What fonts you have installed, how you have your software configured, software versions and so on all conspire together to break your lovely artwork. What if I can't supply a PDF? If you have your file in a different format and you cannot create a PDF, then please call the Help Desk for advice on how to proceed. We can usually sort something out! Supply your PDF as one file. Not separate files for the cover and inner pages, or any other combination. Each page in your original documentation should be a separate page in the PDF. NO SPREADS, don't supply the front and back cover as one page, don't try to impose your booklet. Just the pages (including the cover), in the right order, one at a time. If you have created a lovely cover, where the artwork spans the front and back covers, don't worry, our imposition software will line it all up again perfectly. Supply the right number of pages. Don't order (for example) 16 pages and supply 14 pages. Please read the advice in the General Information section about supplying pages in multiples of 4 and what to do if you can't. Page order - Option 1 (NORMAL ORDER): page 1 in your PDF is the outside front cover, page 2 is the inside front cover, page 3 is - well - page 3 (sometimes referred to as the first page of "text"), and so on until you get to the last page, which is the outside back cover. This is the NORMAL standard sequence for booklets and brochures and we expect files to be supplied this way for manual proofing. Page order - Option 2 (EASY COVER SPREAD ORDER): this is useful where you have designed the outside of your cover as one spread in a DESK TOP PUBLISHING application such as InDesign or Quark. Unless that makes sense to you, ignore this section! There is a more complete explanation of this in a separate section. In this page order, we still expect individual pages, but they are in a different order, P1 is the outside rear cover, P2 is the outside front cover, P3 is the inside front cover and the last page is the inside rear cover. This option just saves you time and hassle juggling the page order around in the PDF. Autoproofing will ask you which order your file is in, but if you want a MANUAL proof, please let the helpdesk know, otherwise the proofing team will assume that you have submitted your file in NORMAL ORDER. If you can't do this, call the helpdesk for a chat, we can usually help! Make sure all images are "good enough" resolution. 300dpi is ideal for printing. Below 200dpi you may start to notice some deterioration in image quality and below 100dpi there is a risk that the images will be unacceptably poor. Don't panic if you only have (for example) 150dpi, it may be perfectly fine for your print job. Print out a representative page from your soft proof on a desktop colour printer and if it looks OK to you there, it should look fine in the finished article. We will automatically generate a warning on any images below 100dpi, so that you are aware that there is a potential issue, but you can still approve your job. Before a printing machine can print your artwork, the PDF needs to be converted into the native language that drives the print engine. This is done by a dedicated computer running specialised software called a RIP (Raster Image Processor). Transparencies and layers need to be decoded by the RIP and in an ideal world there would be no two ways to interpret them and all software would be bug free. Back here in the real world, it's much more sensible to avoid the whole problem altogether. Transparency and layers are completely useless in print-ready files and can introduce errors. So, just flatten them! If you don't flatten them, we will do it for you and the soft proof that you we generate for you will have transparencies and layers flattened. We will also warn you about this in your report. One more reason why it's important to carefully read your report and look at your proof! Make sure you use a safe zone. HELP > ARTWORK > SAFE ZONES (opens in a new window). Make sure that you understand the effects of creep. Creep is something that only affects very THICK booklets. You can read all about creep elsewhere in this guide. We recommend that wherever possible, you number your pages. This makes it much easier to spot mistakes before they turn into real problems. Be consistent in where you put your numbers and on thicker booklets, watch out for the effects of creep. This has become less of an issue with the latest generation finishing machines as operators no longer have to put stacks of paper into the right bins! It's still always a good idea, but if your design doesn't suit page numbering, it's no longer a big deal. HELP > ARTWORK > BLEEDS (opens in a new window). HELP > ARTWORK > THE BLUFFERS GUIDE TO CMYK AND RGB (opens in a new window). HELP > ARTWORK > COLOUR MANAGEMENT (opens in a new window). The very first thing to note is that you cannot edit these templates. They are simply there to show you dimensions and where we recommend that you place content. 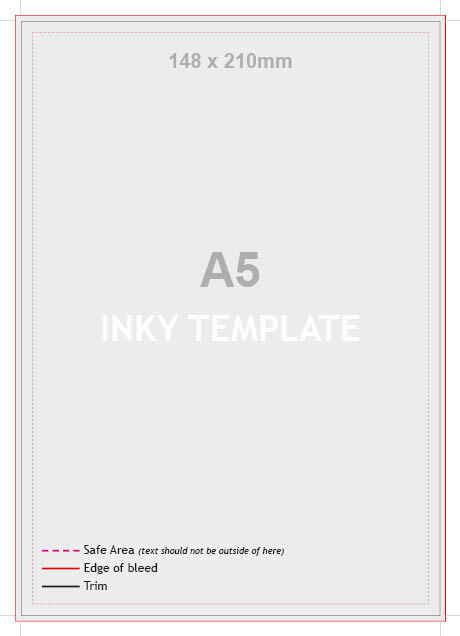 The template will show you information such as the size, bleeds, safe text areas etc. The templates are only a suggested layout. It's your artwork, you can choose to lay it out however you wish. Remember that the templates are not there to be printed, so don't include them with the artwork you send us! Trim lines This shows where the page will be trimmed to. Why have all these pesky guidelines? Take a look at the diagram below. The top row shows artwork with a correct bleed and the safe copy area used, "before" and "after" trimming. Even though the trimming is slightly out on the finished item, it still looks great. The bottom row shows what can happen with no bleeds and no safe copy area. There is a fraction of a millimeter of white space showing, plus part of the "T" is trimmed off. Of course, we've exaggerated a little to make the point! If you can't see your specific page size here, contact the helpdesk for more assistance. Creep is a straightforward concept, but understanding it before you plan your artwork can save a bit of hassle. You don't need to plan for creep with thin booklets as the effect is not noticable. You do need to plan for the effect of creep with thick booklets, otherwise you might end up with an end result you are not happy with. Creep is simply the distance that the paper's bulk pushes the sheet edges out in a saddle stitched booklet. There is an (exaggerated) diagram below to help understand this. A saddle stitched booklet is a booklet that has been stapled in the middle and folded. The operator of our stitch, fold and trim line would probably not agree that he is just using a very big stapler, but that's the bottom line. Each sheet in a booklet has a thickness and when assembled, this progressively pushes each sheet out a little farther from the spine of the book. The result is very noticeable on books with many pages and not noticeable at all on books with only a few pages. This is why we always trim the fore edge of booklets to create a neat result. Creep can cause problems if you don't plan for it. One example is where pages are designed with content very close to the fore edge. Unless this is adjusted, the edge of the content may be cut off. The simple way to deal with creep is to design your booklet with sufficient space on the cut edge opposite the spine (the fore edge). Keep a few extra mm free of text and page numbers and you don't really have to worry too much about it. This is creep is dealt with in 99.9% of all booklets. The complicated way to adjust for creep is to use imposition software that progressively shifts each page in towards the spine. We can do this for you if you wish. There is no charge, but you do need to select manual proofing (manual file check). If you want us to adjust for creep, you need to speak to the helpdesk. Adjusting for creep will have side effects that you need to understand. We have some clever software that (warning, gross simplification ahead) shifts and trims pages in a PDF in incrementally larger amounts, i.e. the inner pages are shifted IN the most and the cover not at all. This is great news if you have designed your booklet with this in mind. It is less welcome news if you have designed each page with intricate graphical designs that interlock from one page to another or photographs that span two pages (oh how we chuckle when we see these designs come in). The problem is that up to a couple of millimetres of this design will disappear from the middle of a thick booklet if we adjust for creep. Don't worry. Just call our friendly Helpdesk and talk it through.